Weeding is probably the least favorite thing to do in your vegetable gardens, but it must be done. Mulching is one way to cut done on the weeds, and mulching with straw is a popular technique because it keeps the plants and vegetables clean and it attracts beneficial insects. This will save you a lot of time and effort weeding, but it also wastes a fair amount of potential growing space. To make use of every inch of your garden, try growing an edible ground cover. This is really just an extension of intercropping. With intercropping, you tuck faster-growing plants near vegetables that will mature much later in the season, such as seeding spinach under tomato plants. Many fast growers, such as lettuce, can be used as cover crops, too. However, you’ll have to keep reseeding as you harvest or you’ll be left with the bare ground again. Instead of a temporary fix, vegetable gardens can be mulched with long season plants or even with non-aggressive perennials. While there will be some competition for water and nutrients whenever two plants are grown in close proximity, this should not be a problem if you have good, rich soil and you are making sure your vegetable garden is getting regular water. Learn more about several edible plants that you can use as ground covers. 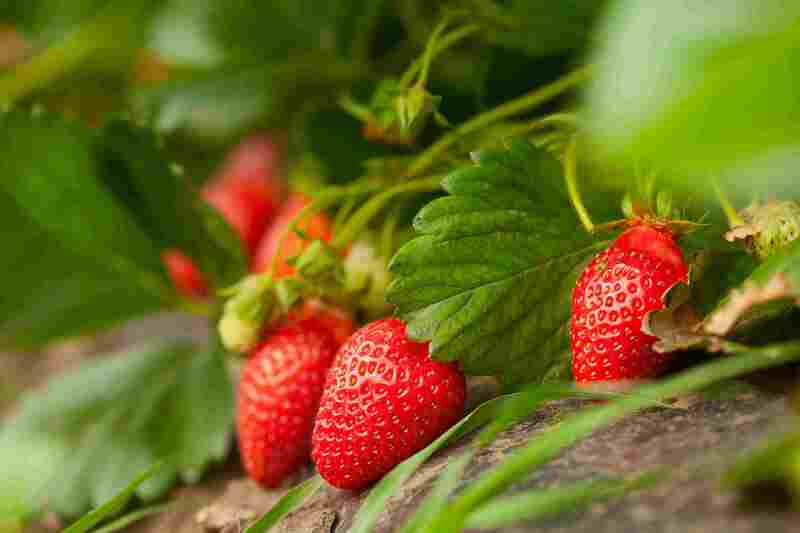 A lot of space-limited gardeners have a problem with where to plant a strawberry bed. How about under a row of eggplants? They will still get plenty of sun under there, and they’ll even help keep the eggplants propped up and standing tall when they are heavy with fruits. This also solves the problem of thinning out the plants in your strawberry bed, since you’ll need to remove a few the next year to plant a new vegetable, such as kale, in the row. There are never enough flowers in the vegetable garden. Flowers do more than dress up the garden, they attract more pollinating insects, which is crucial in a productive vegetable garden. Nasturtiums are a common sight in many edible gardens and their floppy, trailing nature makes them a great choice as a ground cover. Plus they are edible, so once again you’re getting two crops in the space of one. You can even make Poor Man's Capers from the seeds. Of all the creeping herbs, oregano is probably the easiest to keep in check. Yes, it spreads, but it is very forgiving of having its roots disturbed. Oregano does need a lot of sun and prefers well-drained soil, so it would work best under plants such as peppers that would not shade them and that do not need excessive water while fruiting. Regularly cutting the oregano to use in the kitchen will keep the plants bushy and low. Once your oregano plants flower, expect to see them covered in buzzing bees. This one is a no brainer if you have ever heard of the Native American tradition of the Three Sisters, where corn, squash, and pole beans are interplanted. The corn serves as a trellis, the beans add nitrogen to the soil, and the squash serves as the ground cover. Any vegetable that grows as a vine, but does not climb and adhere on its own can be left to sprawl on the ground and serve as cover. Once again, space-challenged gardeners tend to shy away from this approach, because it uses too much precious real estate. But if you let them sprawl under tomatoes or around Brussels sprouts, you won’t lose much. This can be a bit tricky with really enthusiastic vines, so your best bet would be to stick with cucumbers or melons that have smaller leaves and shorter vines. You don’t want them to spread so much that you can’t reach the other vegetables in order to harvest them. And you will need to make sure they don’t try to climb your tomatoes, smother them, or pull them down. Sage isn’t a great choice for all climates, but in cooler climates where its height and spread are kept in check by cold winters, it would work fine. It tends to grow to a low eight to 12 inches in height and spread out by 12 to 18 inches. Since the branches grow somewhat horizontally, they will shade the soil and keep it cool, They also do a decent job of suppressing weeds. They are perennial and evergreen, so you may need to do some thinning in future years. But sage tends to be a short-lived perennial and very amenable about being transplanted. Not all of these choices will work for you, but they add to your bag of tricks for maximizing your vegetable garden without adding more work for you. They are definitely worth a bit of experimentation.